Why Do Christians Suffer? Is This God’s Will? Tragedy is a monster that comes to everyone at some point or another. When it strikes, the after effects can be devastating. While going through difficult circumstances in life we are always put against the question, “why”. Why would God allow death and disease? Why would the Almighty allow men to steal or lure a woman into adultery? Is this God’s will? The answer is yes. God does not condone the sin; He uses the times of struggle to refine us. The book of Job is an excellent resource when dealing with this topic. We can learn a lot from Job and how he conducted himself. Chapter 2 starts out the same way. God repeats verse 1:8 again to Satan and gives him certain rules. And the Lord said to Satan, “Behold, he(Job) is in your hand; only spare his life.”(Job 2:6) Satan strikes Job with horrible, painful sores all over his body. Even his wife tells him, curse God and die. (Job 2:9) Again, Job’s response is truly remarkable. He says to his wife, “Shall we receive good from God, and shall we not receive evil?”(Job 2:10) Job understood that God is in charge over all. God is sovereign. This is why God allows pain and suffering, so that we can be made perfect through perseverance. Job truly was a wise man. Not once did he ask “why”. His response was always a recognition of God’s sovereignty. This is the direction that we as believers need to strive for in our suffering. With this mind-set, we will have a clear vision of what God is doing. James 1:2-4 says, count it all joy, my brothers, when you meet trials of various kinds, for you know that the testing of your faith produces steadfastness. And let steadfastness have its full effect, that you may be perfect and complete, lacking in nothing. 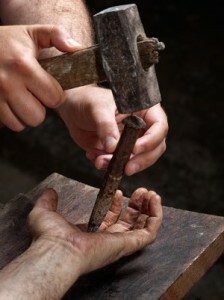 This is why God allows pain and suffering, so that we can be made perfect through perseverance. It is so important to be in the Word and memorizing scripture so that when Satan comes, we will be ready with an answer. Matthew 4:1-11 shows Jesus, Himself, doing this. Satan comes to Him(allowed by God) 3 times to tempt Jesus and Jesus shuts Satan down with scripture every single time. Whatever storm comes, just remember that it doesn’t last forever and peace always follows eventually. God also wants to bless His children too. At the end of Job, God restores Job’s fortunes. God gives Job twice more than what he had before. Also, he has many more children and he lives 140 more years to enjoy all of it! It even says that no women were as beautiful as Job’s. God loves us all so dearly. If we cling to Him when storms come, He will show His love more than we ever could have known. I am in one of the biggest, hardest storms of my life right now. Satan kept plugging at me the other day and Job popped into my head. I said to Satan, “have you considered my servant, Derek?” The peace of God filled me from my head to my toes when I said that. I know God is in control. Keep fighting the good fight! God allows trials so we can draw closer to Him. Looking for some more related Bible studies? Is Suffering Avoidable If You Have Enough Faith? Such grace and beauty in this Dereck. Praying for you brother. It reminds me of 1 Peter 4:19 which says, “So then, those who suffer according to God’s will should commit themselves to their faithful Creator and continue to do good.” and “It is better, if it is God’s will, to suffer for doing good than for doing evil” (1 Pet 3:17). I know that a joy shared is doubled and a sorrow shared is halved. May it be so with you brother. Well done her. Thank you for your kind words Jack. I think of Job frequently when trials come my way. Instead of thinking about the bad that is happening, I focus on the good stuff, like my kids and that I have a good job. Most importantly, the trials bring me closer to God. It is my hope that every believer would come to rely on God in every single circumstance that comes their way, good or bad. Also, Phil 4:13 is such an encouragement always, “I can do all things through Christ who strengthens me!” Christ is the source of everything good! God bless you! Suffering is one of the most misunderstood aspects of the Christian’s life. You’ve done a great service by helping us understand it better. We must trust God in the good times and the bad. Thank you Robert. Not many consider it pure joy when we face trials of many kinds, but the joy comes in knowing that when the trial is over, we will be closer to God! There is also joy in knowing that God will not allow us to go through anything we cannot handle. With Him as our solid rock we will prevail through all things satan tries. I had been doing a little bit of research into this and found a blog, “We are THAT family,” and I thought the author did a great job of dispelling with the worldly belief and explaining what it really means to be suffering supported by Scripture. “Actually, the Bible promises us hardship in this life and tells story after story of suffering. ‘For we do not want you to be ignorant, brothers and sisters, of the affliction we experienced in Asia. For we were so utterly burdened beyond our strength that we despaired of life itself. Indeed, we felt that we had received the sentence of death. But that was to make us rely not on ourselves but on God who raises the dead.’ [2 Cor 1:8-9]. And He has endured every sorrow we may carry. In sum, there may be times in our lives when we will be up against great pain, far beyond what we can handle. Look at certain cases of death for example, like murder. There are awful recounts of such horrible murder, and that kind of pain before death or unconsciousness sets in must be beyond anything that you or I could ever comprehend. But, it is through those experiences where there is still peace in our faith. God allows suffering so that we will come to rely on Him more and that He will shine through us. Hello Jen. I must say thank you very much for this comment because I think you are right. The scripture speaks very clearly on this. I will refrain from using this saying from now on. I actually just read a different blog after I read your comment and the author says “a more accurate statement might be that ‘God will never give us more than He can handle for us.’” (thepaperthinhymn.com) Thank you again for your wisdom and insight into this. God bless you! It just so happens (coincidence, I think not) that I have been given this very topic to write on for a September article right here at What Christians Want to Know. I agree wholeheartedly with what you wrote, Jen. It is readers like you that encourage us in our ministry on this website. God bless you. Thank you so much Derek and Robert! I’m so happy to hear this explanation made sense. I’m also so glad I found this website! Robert, I can’t wait to see that article. I’ve been looking into why God allows us to suffer, and I’m sure Robert’s article will really hit home to people. God Bless! Thanks for sharing, it has enlightened me to the struggles and sickness ive been going through. So many times ive asked God	why and to take this cup from me with out cursing his name. No more only praise will I give him through all my hardship from this day forward. Thanks for sharing and God bless. All to many times satan wanted me to blame God, but I didnt instead I grumbled and complained and cried out why me, why me. I have a much better understanding now. Thanks again. Blessings upon you Jereome! God is good always! I believe that it is essential that we all have a core group of Christians in our lives that we can turn to in times of need for prayer especially. I have a few friends that I turn to all the time to ask for prayer. I encourage you, if you don’t already, to find 2 or 3 really devout Christians from your church to surround you in prayer. When 2 or more gather in His name He is there. This doesn’t mean that your problems will go away for sure, but you can be assured that God will be listening and that He loves you! Thank you for your transparency in your comment sir 🙂 God bless you! This was lovely. I just wrote about this topic recently in my blog as well. I am also suffering some tough trials and I think this is a popular question because everyone has suffered at some point. Thank you for your kind words Summer. This is indeed a popular topic. God never promised a trial-free or a stress-free life, but when we draw on His strength we all can be assured that He will take care of us no matter the outcome. Thank you for stopping by WCWTK. Feel free to stop by anytime. God Bless! Job is one of my greatest hero’s in the Bible. I think that a great deal of what has happened in my life is my fault or brought on by me. I have MS, I was diagnosed in 1996, but, I continued to work for another 9 years until I had to seek, and was granted a disability. So, that is how I get by. I am a believer, almost my whole life, I have believed in God and Jesus Christ, but, I have done things that were just not Christian like, and I know my situation is nothing like Job because he did not do anything to bring on his situation. And yet, he still believed and prayed before the Lord. I did things even though I knew better, and I just wanted to do my own thing. I know that I have to do a better job at reading and understanding the old testiment. I love reading about Jesus, so I do a better job at reading the new testament. But, I cannot help but think I am a hypacrit for trying to study the scriptures now. I use to think I was ready to meet God either in death or when He returns. Now, I know that I am not ready. I feel like I have learned nothing. I feel like I live in fear all the time, and I live waiting for the next thing to happen. I hope that I can help you with some encouragement. Jesus said, “I am the Way, the Truth, and the Life. No one comes to the Father, except through me.” It is your belief in Christ that saves you from hell. If you have accepted Him as your savior and you believe what he says in the verse I just quoted, you can be reassured that you have a room already ready for you God’s house in heaven. You feel fear because of your past. Christ is bigger than your past. He will forgive you if you just ask brother. Then its time to move on with boldness, reassured that Christ has you in His arms. I think Satan is really feeding into your fears right now. Your story is no different. We ALL have been prodigal sons one time in our lives. Also, the OT is important because of all of the prophesies that came from it to be fulfilled in the NT. You don’t have to feel the shame and guilt anymore!! Give it to God and He will change your life for good. Please know that I will personally be praying for you brother. Lay your burdens at the feet of Christ and the rest is history. God bless you sir! I just read your article and felt good to confirm God does let us suffer to become closer to Him. But, its taken me SEVERAL bottoms to submit 100%. I cannot get enough of the Bible and bible studies and on Sunday…I don’t want the pastor to stop. I am a broken down lamb running into the Lords arms FINALLY coming home clean and sober after 5 years away from Him and the church. I am an alcoholic and on August 12, 2010, I let someone I knew only 3 weeks convince me to let him drive my SUV drunk. I got out of the taxi I was taking and into the backseat of my SUV. Five minutes up the road, he was going to fast, crossed the yellow line and instantly killed a 22 year girl. My SUV rolled many times with my left arm out window. There was three people in my car. We were all flights for lifes. Driver is in prison for 10 years (I just got convicted to send him this article on suffering and a letter saying ??. I have never been angry at him, but say I made the worst 30 second decision of my life. In the past two years, I have had 14 surgeries. 9 to save arm but they had to amputate 2″ above the elbow, and the rest to make it able to look like an stump where I can get a prostheic arm. This is not my suffering, Ive adjusted to this. My husband divorced me, one of my two teenagers will not speak to me, and my mom says I disgraced the family and ruined everything she worked for her whole life. I am not invited to holidays or bdays anymore. 4 weeks ago while i was in hospital due to staph infection in stump and also fell 4 steps down and rebroke right arm, she wrote me a letter asked me not to call her anymore. All my family has given up that my drinking will ever stop and how many more rock bottoms can I hit. I now say enough is enough…my church is my family now and take care of my needs – physical and spirititual. Sorry so long, but just today been crying and pleading to the Lord to help me. The two year anniversary of accident is coming up….losing everthing in life including my arm and restarting over at 47 is nothing compared to the family losing their daughter. Please pray for them during these next few weeks. We have started a recovery course at the church, once I admitted to everyone that why i disappeared was i was an alcoholic…i felt so much better. Job is my hero and I believe with all my heart that God has been trying to get my attention back on him and not sin. Your article really helped me and I want others to know bad times and things do happen to us to go running back to the Lord where I will stay this time until eternity. Hello Denise. It is a HUGE praise that you have recommitted your life to the Lord!! God NEVER gives up on His children! I can hear your sorrow about your family. Keep praying for them. God is in the miracles business. I encourage you to find a few really devout Christian friends from your church, if you don’t have any already. It is a great encouragement to be able to go to close friends for prayer. God doesn’t always answer our prayers like we want Him too, though, so it is important that while we are in crisis to ask Him, “what can I learn from this Father?” With that kind of heart, He can mold you into the woman that He has always meant you to be. Thank you so much for telling your story. I will pray for you and your family. I hope and pray that you keep up those prayers for them. I am so sorry for the accident that you had. I hope you will tell us here on this site, how things are going with you. Derek, what a wonderful and insightful article. It gives such grace to the heart. I like how Job concluded his talk with the LORD, “I heard a lot of things about You but now I know!” That’s what going through (with Him) does for us, we learn of Him Derek and find Him to be in our lives a “Way-Maker, Peace, Comforter and a sweet Never-Leaving Companion”. We are awed to see Him turn it all around for our good – that no weapon though formed shall prevail – that His grace is truly sufficient – we learn that by the lessons gleaned from suffering. We learn His Word works – it becomes real as we learn how to apply it in our lives and that troubling circumstance. Derek, you are an absolute blessing – an anointed pen used to share the goodness of our great God. Blessings to you and family, I’m definitely looking forward to reading more! And thanks again to all of the authors who continually share the Good News in such a practical way! Hello Iyanth. Thank you for your encouraging words. You are absolutely right. God uses every weapon meant for evil and makes good out of it. He always brings His children through, no matter what happens. Sometimes this means seeing our loved ones leave much earlier then we thought to be with our Father. We must always remember that God is sovereign and He is in complete control. Blessings upon you! Am aborn again since 1996 i read about unpardonable sin after some years butthis year the devil is condeming me, my wory is that i experients thoughts that are awkward but deep down my heart iknow is not me and my throat feels like there is something ilove jesus idont want to sin please pray for and help me what to do. I had a Christian Bible teacher tell me once that if I was genuinely concerned that I had ever committed the unpardonable sin, then I hadn’t because God will turn away from you if you commit that sin. You won’t feel Him moving in your life or experience any of the blessings that He gives. It sounds to me like you have genuine concerns Ruth. The devil will always condemn you and everyone else. That is his one and only goal in life, to bring as many to hell as possible. Keep Christ at the center of your life. When you feel like Satan is trying to get at you, pray to God that He would send Satan away from you. If you are going through a trial though, that is gonna be an experience that will draw you closer to God as you rely on Him through your suffering. When your trial is over you will be stronger with God. Remember, you will always be a sinner but God will always forgive you too. Be strong and always fight temptation. When you sin, ask God to forgive you and He always will as long as you are sincerely repenting. I also encourage many people on this site to find a core group of Christian friends that you can meet with and pray with as a group. There is power in prayer. When you have many people praying, it is even more powerful. Thank you for visiting WCWTK. You are always welcome here and we appreciate any comments you have. God Bless!! Thank you for your kind words Jess. I read the article you posted and it does have some good material there. I really enjoyed reading the section about how we suffer now to be glorified later. It was an encouragement to me. Blessings on you and your loved ones. I went to a father’s group in Texas (just north of Fort Hood) where some ex-military west pointer gave some real eye-opening comments. He basically said that the current Divorce process, legislation, court system and military is all one scheme that was put in play around early 1960‘s. It was put in place for the Vietnam War, that’s when the divorce’s started to sky-rocket across the country (Google statistics). That in addition it was also designed to be one huge cash-cow to lure greedy lawyers to facilitate and destroy more families on the civilian side to get enough statistics to make it comparable to the military statistics. However the military numbers are still much higher. That is why they then modified the scheme to use on police nationwide to raise the civilian stats. It is designed to send single male soldiers to war and deny ex-wives any financial support that was initially and may still be coming from the military/ pentagon’s money pockets. To the military, the soldiers wives are expendable as are the soldiers and also their children! Less money the military spends on wives, kids, ex-soldiers, etc the less they have for their drones, guns, or bullets. The scheme is very very complicated but based on very slow very subtle psy-ops brainwashing tactics. He said that any Freedom of Information request will gradually reveal key pieces of data that when analyzed together with confirm all this. This the reason why the pentagon does not want to release documents related to divorce. Part of the even bigger Military-Industrial complex. Basically makes wives and soldier fight and hate each other. The scheme basically exploits women’s emotional traits to spread itself to other victims. The media contributes to the fear mongering and makes things worst. Fear (PTSD etc) makes women fear for their safety thus they then go pleading to the oh so willing authorities who provide them with military issued cookie cutter divorce packets to take to a civilian lawyer. They do this to hide where the process initially starts. Why We Should Expect Suffering? Previous post: What Does the Bible Say About Helping the Poor? Next post: How Do We Know the Bible is True? Is it Really the Word of God?